Hello and welcome to the 160th installment of the SWD. 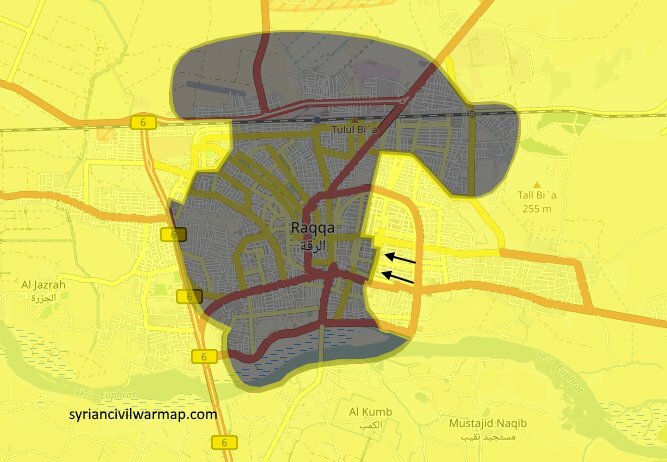 Syrian Democratic Forces reportedly captured Rafiqah district from the Islamic State, in the old city of Raqqa. IS’ Amaq Agency reported that another SVBIED hit SDF‘s positions in Hisham Abdul Malik district. Syrian Arab Army, backed by allies, allegedly captured; Al-Dukhailah, Bir al-Sabkhawi, and Al-Sabkhawi gas field from the Islamic State. Situation has escalated between the rebels, once again, as the “mortar manufacturing workshop” previously under Ahrar al-Sham, defected to Hayat Tahrir al-Sham. Leader of the workshop is Abu Raed al-Hajji. Shortly after the workshop defected, Ahrar al-Sham sent a military convoy to try and capture the workshop. Clashes between Ahrar al-Sham and defected elements wounded two civilians. Hayat Tahrir al-Sham arrested the former military official of Ahrar al-Sham, Omar Ezzo, in the recently-captured Salqin. Hayat Tahrir al-Sham’s commander Ali Hussein al-Mukhtalif, known as Abu Muhammad al-Shuhail, was poisoned in Idlib. Al-Mukhtafil was a “chief” of the eastern sector in Hayat Tahrir al-Sham. Two explosions rocked the city of Idlib, more precisely, the clock square. So far, casualty numbers have not been released. Islamic State raided Syrian Arab Army’s position east of Al-Hail gas field, reportedly killing four soldiers. SAA‘s tank was also destroyed on the same front, with an anti-tank guided missile. 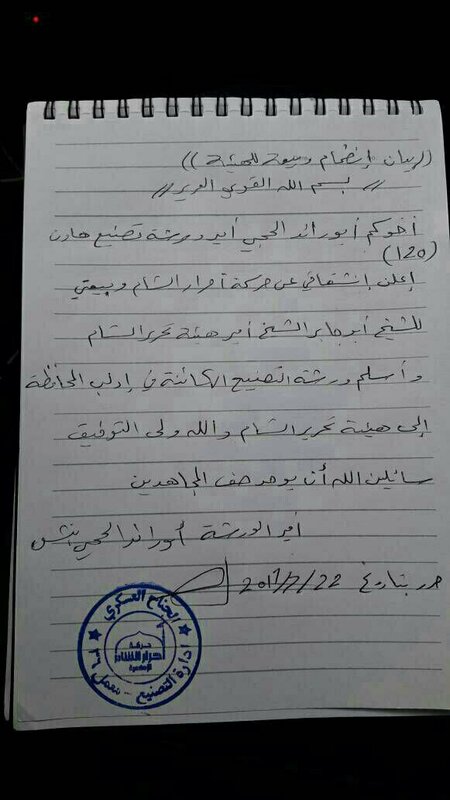 Syrian Arab Army and Jaysh al-Islam signed a ceasefire agreement regarding the former’s halt of the operations in East Ghouta. Ceasefire, which was mediated by Egypt and sponsored by Russia, includes the entry of humanitarian aid to the besieged Ghouta and evacuation of wounded/injured civilians. Since Faylaq al-Rahman didn’t sign the ceasefire agreement, ceasefire will only apply on the eastern, rural part of the East Ghouta, meaning that the attacks will stop on Al-Rayhan, Hawsh al-Dawahirah and Al-Nashabiyah fronts. If Faylaq al-Rahman doesn’t sign the agreement, SAA might continue operations on Ain Terma and Jobar fronts. 11 rebel groups from Daraa and Quneitra merged and formed “National Liberation Front of Syria”. The front statement says that they are ‘bringing the revolution back on its feet’, free from outside influences and agendas. The groups that are a part of the newly-founded front are: Jabhat Ansar al-Islam, Liwa al-Shahid Majd al-Khatib, Liwa Suqur Beit Sahem, Liwa Suqur al-Jawlan, Firqat Fajar al-Tawhid, Al-Firqat 16 Quwwat Khasat, Liwa Shuhada al-Sabtin, Firqat Salah al-Deen, Kataib Hawran, Katibat Jund al-Easima, and Liwa Suqur al-Badiyah. Several Free Syrian Army’s fighters, including a commander, were wounded by an improvised explosive device, which was planted in their car by unknown individuals. Explosion occurred as the Free Syrian Army’s elements were driving in Inkhil. Iraqi Army’s 22nd Infantry Brigade, backed by the National Security from Al-Tarmiyah, conducted a counterinsurgency operation in Tel Tasah area, north of Baghdad. Iraqi forces arrested an IS’ official of a mortar detachment and seized several improvised explosive devices and mortar rounds. Iraqi Air Force conducted several airstrikes over IS-held Rawah, western Anbar. According to the Iraq Joint Operations, airstrikes destroyed an IS’ HQ and two weapons depot, also killed a dozen of IS’ fighters and destroyed several VBIEDs ready to be used against the Iraqi forces and/or civilians in the future. 6th Infantry Division of the Iraqi Army’s 24th Brigade, discovered and safely removed two improvised explosive devices and several mortar rounds from Al-Karaghul area, west Baghdad. Explosives and rounds were left behind by the Islamic State’s elements. Iraqi Federal Police’s 5th Brigade arrested an Islamic State’s fighter, north of Baghdad. Further operations in the area resulted in discovery of four improvised explosive devices, in one of the orchards. On the 21st of July 2017 CJTF-OIR has conducted nine strikes in Syria. CJTF-OIR‘s main focus in Syria at the moment is Raqqa region where they did five strikes supporting SDF‘s operations against IS destroying three fighting positions and an anti-air artillery system, and damaging a supply route. Other areas where four airstrikes occurred are Abu Kamal (Al-Bukamal) and Deir al-Zour, destroying four IS oil tankers, four oil storage tanks and a vehicle. Full report on CJTF-OIR strikes conducted in both Syria & Iraq can be found here. Islamic State’s fighters assassinated a member of the Afganistan’s intelligence agency, National Directorate of Security (Riyasat-e Amniyat-e Milli), in Naranj Bagh area of Jalalabad city. Yesterday, Islamic State clashed with the Afghan National Army reportedly killing five soldiers and destroying a Humvee and a bulldozer. Clashes occurred in Mamand district, Asher directorate, Nangarhar. Islamic State’s sniper killed three Filipino soldiers in Llod Madaya neighborhood yesterday, according to Amaq. Today’s clashes between the IS and Philippines Army allegedly resulted in death of five latter’s soldiers and injury of four others, in Marinui district, Marawi.